iPhone 5 review: Apple's smartphone is the best yet, but do you really need one? It may be the greatest smartphone on the market. But do you really need one? 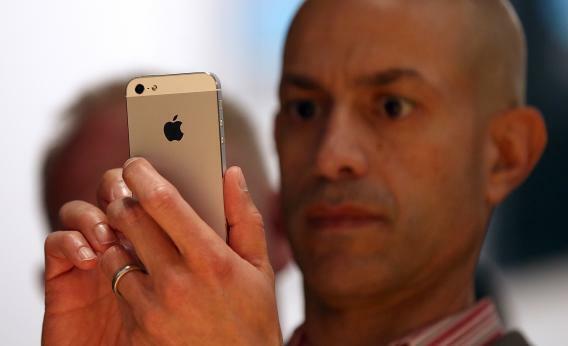 An attendee looks at the new iPhone 5 during an Apple special event at the Yerba Buena Center for the Arts on Sept. 12 in San Francisco. From the lines that formed outside of Apple stores in the days and hours ahead of the iPhone 5’s release Friday morning, a visitor to Earth might have assumed that the device was required for human survival. Rest assured, it isn’t. Oh, it’s a great gadget. A graceful, intuitive, thoroughly impressive gizmo that may change your life, especially if you don’t already have an iPhone 4S or the latest Android smartphone. Just know in advance that it won’t necessarily be a change for the better. Unlike most people who write about technology for a living, I don’t own all the latest mobile devices. In fact, until today, all I had was a timeworn iPhone 3G, which was rendered old news more than three years ago with the release of the markedly faster iPhone 3GS (remember that?). So when I laid hands on the iPhone 5 this morning after braving a modest one-hour line at an AT&T store, I wasn’t just comparing it to the iPhone 4S, which came out this time last year, or against state-of-the-art rivals such as the Samsung Galaxy S III, HTC One X, or Motorola Droid Razr, which use Google’s Android operating system. I was also judging it against the state of the art circa 2008. As it turns out, the iPhone 5 is a wonderful piece of machinery by any standard. Compared to the 4S, it’s tall, thin, and light, yet it’s also significantly faster. I downloaded, opened, and started using the Twitter app on the iPhone 5 using AT&T’s 4G LTE network in the time it took to download it on the 4S. Yes, there are Android phones on the market that equal or surpass the iPhone 5 on paper. Many have larger screens. Some have better battery life and comparable features. But the iPhone 5 wins on fit and finish, and on details that you can’t intuit from a spec sheet. Its interface is sharp, fluid, and responsive, and it somehow feels both sturdy and nearly weightless in your hand. And with the possible exception of its new maps app, which suffers from accuracy problems, it’s free of the bizarre and boneheaded design flaws that mar many of its competitors. There are no buttons out of place, and no important feature is hard to find. When Apple launched the iPhone 5, some griped that it was more of the same, as opposed to something revolutionary. (I was among them, I’ll admit.) But there’s an upside to continually refining a great product, year after year: It keeps getting better. It would be silly to say that the iPhone 5 is the perfect smartphone—there’s always room for improvement. But it’s closer to perfection than any smartphone has ever been. And that’s the rub, if there is one. For people who, like me, are still accustomed to phones that specialize in communication, it’s both exhilarating and a little alarming to upgrade to a phone that’s also optimized for so many other things. It’s exhilarating because it feels like you’re carrying the whole world in your pocket at all times. And it’s disconcerting because sometimes that feels like rather a lot to be carrying around. It was distracting enough when my phone could make and take calls and send emails and text messages. Now that I can stream high-definition movies, shoot video, read books, and videoconference, I’m a little concerned that I’ll never pry my nose from the screen. That my old smartphone could barely manage to upload a photo to Facebook was frustrating, but it was also liberating. It gave me an excuse to simply enjoy the view. This problem is not unique to the iPhone 5, as owners of the iPhone 4S or any number of other state-of-the-art phones can vouch. The iPhone 5 is merely the finest exemplar yet of the phone that can do it all—except for all the things in life that you really need to do.